Vitor Belfort says he’s ready to return. How about fessing up first? Time to celebrate for Belfort? Not quite yet. According to Vitor Belfort, he’s cleared to compete again. Also, he wants to immediately be put back into the UFC middleweight title challenger spot he either vacated or was forced out of, depending on who you believe. To him, his future is that simple. "No, we haven’t had any conversations with him," Nevada Athletic Commission chairman Francisco Aguilar told FOX Sports. Well, that’s interesting, since Nevada is where his problem originated and where it must ultimately be resolved. Belfort has seemingly had a problem with telling the truth lately. Or at least, telling the whole truth. He is not, as he suggested to MMAFighting.com in an interview last week, cleared to fight again. He is not even close. Yet he feels emboldened enough to make demands. 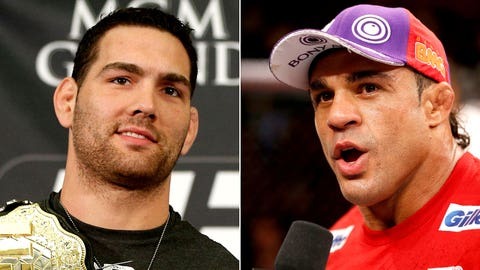 "Give me what is mine," he told the website in reference to the title shot against Chris Weidman. This is one of his patented Belfort barrages, where he fires off a whole bunch of bombs in hopes that something connects. At worst, he gets his opposition backpedaling. This time though, it’s all swings and misses. No one is in the mood for his posturing. It’s put up or shut up time. Even Dana White, who has at times defended Belfort as some sort of media victim of a testosterone replacement therapy witch hunt, shook his head at Belfort’s recent return to the headlines, calling his comments "hilarious." "He’s got a lot of work to do," he said. "That s*** just doesn’t happen like that. You’ve got to get on the agenda. He’s got a lot of work to do." Yeah, like repairing his image. Maybe he should start by revealing those Feb. 7 drug test results that he feels have been locked in a box with a thrown-away key. Oh, yeah, remember those results? The ones that his lawyer labeled "not relevant" on the same day Belfort was pulled from the Las Vegas card? They’re going to be extremely relevant very soon. Aguilar told FOX Sports that whenever Belfort gets around to submitting an application, the next probable step is a full commission hearing. And Aguilar has previously said when that occurs, Belfort’s Feb. 7 random drug test results would become public. You know what that means? It means Pandora’s Box is about to be busted open. It means he should just get it over with now and release the complete results of his test. This whole thing is getting very Lance Armstrong, very A-Rod. By his refusal to discuss these results, the story never goes away. The commission is not legally allowed to release the results since Belfort voluntarily took the test without providing consent to disclose them. But Belfort could release them whenever he wants to. In refusing to do so, he has drawn a black cloud over his own head. Michael Bisping and Luke Rockhold, among others, have publicly reasoned that no one would hide a clean result. That seems a very logical conclusion, doesn’t it? Especially since we know he failed a test in the past, back in 2006. Remember when he had this to look forward to? Let’s also keep in mind that Belfort had no problem telling MMA Fighting last week that he recently took and passed "all the tests that Nevada requires." So that was relevant information to share with the public, but the commission-mandated test results weren’t? Unless he retires — something he’s never once hinted at — commissions are going to want to know, and maybe even demand, the results of his February test. Several regulators told FOX Sports last month that they will require those results before granting him a license to compete. A refusal to provide it would sack his application. For now though, he’s not talking, unless it’s to advance his own agenda. His attorney Neal Tabachnick did not immediately respond to a FOX Sports’ interview request, either. It would be nice to know when exactly Belfort planned to apply for a license or why he’d say he’s been cleared, or at the least, when he’ll pass along the results of that test taken nearly three months ago. Instead, he chooses to let speculation and disinformation run amok. It’s a matter of time now, anyway. The results will eventually come out during a licensing hearing and we’ll find out what he’s been hiding. There’s no reason to wait. Before he comes back, he should focus on coming clean.